At SPI, we were sad to learn that Jessie Cohen died earlier this week. 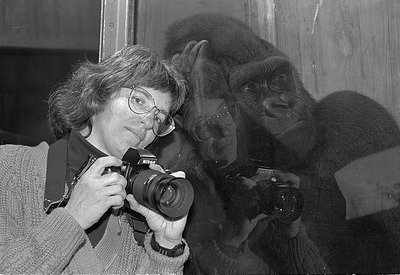 Jessie was one of the photographic mainstays at the Smithsonian; she started working at the Smithsonian National Zoo in 1979, photographing animals, their living quarters, and behind-the-scenes events for exhibition, education, and marketing purposes. In addition, Jessie also managed the Zoo’s exhibition office photo department, and oversaw a photo-library of hundreds of thousands of images, including every type of image—from early glass plate negatives to the most recent digital photos. I’m glad that I got the chance to work with Jessie a while ago, on a video shoot she was instrumental in helping us organize for click! photography changes everything. Fascinated with the fact that pandas were photographed so often that they inevitably became celebrities, I wanted to explore how and why pictures of panda were made and used at the Zoo. And so, we at SPI called Jessie and enlisted her help, photo archive, and expertise. Working with her and Lisa Stevens, Curator of Primates and Pandas, we scripted and taped the video that’s featured on the project website. Watch it and you’ll see Jessie at work, photographing Tai Shan, the now not-so-tiny star zoo attraction, who Jessie had been documenting since his birth. Jessie met us at the zoo early on a hot July morning in 2008, before regular visitors were allowed in. Working alongside the video crew, I was fascinated as I watched Jessie strategize and then stage-manage what was, in essence, a panda photo op. 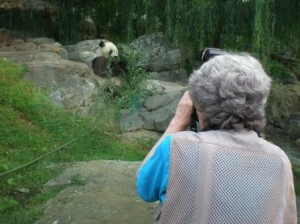 She knew the site, our two-toned subject’s behavior, and pandas’ appetites well enough to make sure that multiple clumps of bamboo be placed near where she told us to set up the video equipment. Jessie also good-naturedly accepted the fact that we’d need as much patience as luck if we were going to get the kinds of pictures we were hoping for. When you look at the final video filled with the fantastic images Jessie shot that day, as well as some made earlier, you’ll also get a glimpse of Jessie, the accomplished pro, thoroughly engaged and at work. In an interview done for her alma mater, Beloit College, Jessie once said, “As a kid I was fascinated with the Smithsonian. I had this idea that I wanted to work at the Smithsonian and make dioramas. It was a vision—a fantasy.” And in reality—since photographs, like dioramas, isolate and encapsulate their own little worlds—she accomplished what she’d always dreamed of. She’ll be missed. Visit here to see photos by Jessie Cohen during her time at the National Zoo.